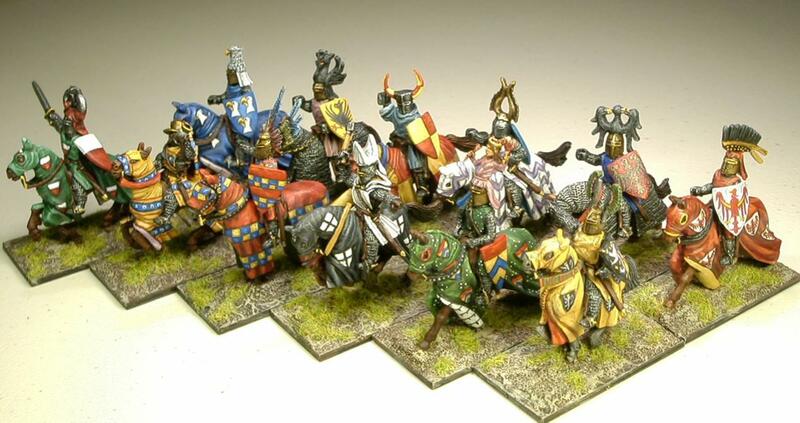 Finished half of the unit of knights for the early-HRE army. The figures are from Old Glory, Battle Honors and Mirliton. 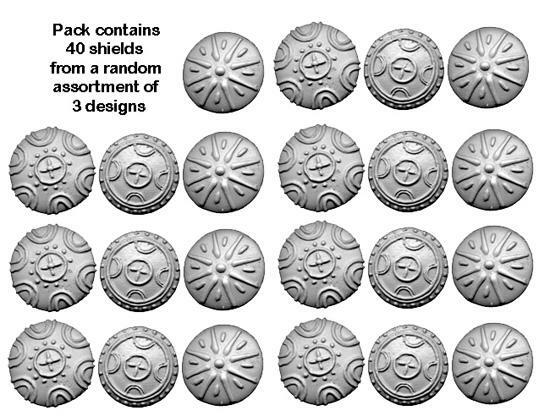 All but the one of the helms are from Mirliton. The helm with the horns quartered in or (gold/yellow) and gules (red) is an Old Glory piece. 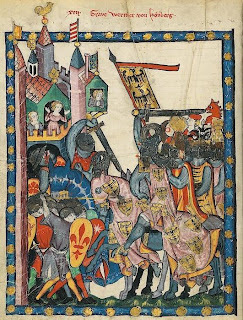 In the image below the two figures on each end are from Mirliton; the one in the center is a Battle Honors figure with Old Glory helm and horse. Otto Von Brandenburg's shield has a paper image from Mirliton glued on - and weathered a bit. The next image are all Old Glory figures and horses - however the two great helms are from Mirliton; as well as the paper shield image glued onto the rider on the right. 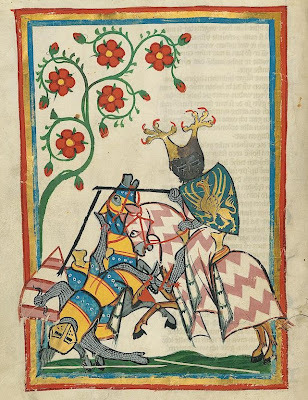 All of the heraldry - or at least the patterns - are from the Codex Manesse. 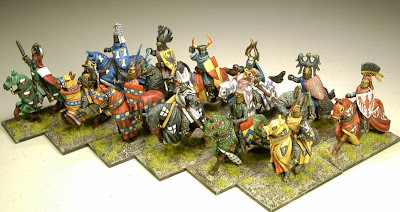 Here are most of the remaining knights for the unit. I'm debating on using an Old Glory figure with a mitre cap too; as I plan on going with an Early Clerical army - since this will allow me to use light cavalry from the Hungarian list. NOTE: I was informed by a comment posted here that the figure on the far-right is not Battle Honors, but actually Gripping Beast. It was sold in a Battle Honors blister at my local gaming store - probably very old stock. Painted up a couple of knights for the HRE army; I know it's slow going, but I've been doing other things and had to make myself sit down and paint for a bit today. The one on the right in the photo below is the Mirliton Ulrich Von Lichenstein figures. The one on the left is a Battle Honors figure with an Old Glory helmet from the Teutonic Knights set. 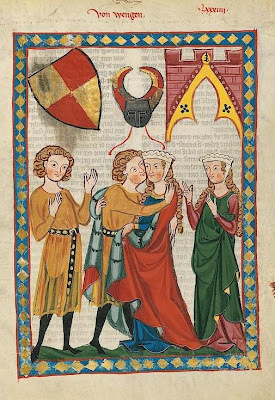 The guy on the left is based on the illustration below from the Codex Manesse of Burchard von Wengen. Since it only shows his helmet and shield, I took the liberty to use one of the Gripping Beast figures with a sleeved surcoat. The horns on the Old Glory helm isn't exactly like the one illustrated, but close enough. A couple more views of the figures. The Von Wengen guy will go on a horse with mail barding. Notice how the mail is sculpted differently on the two. 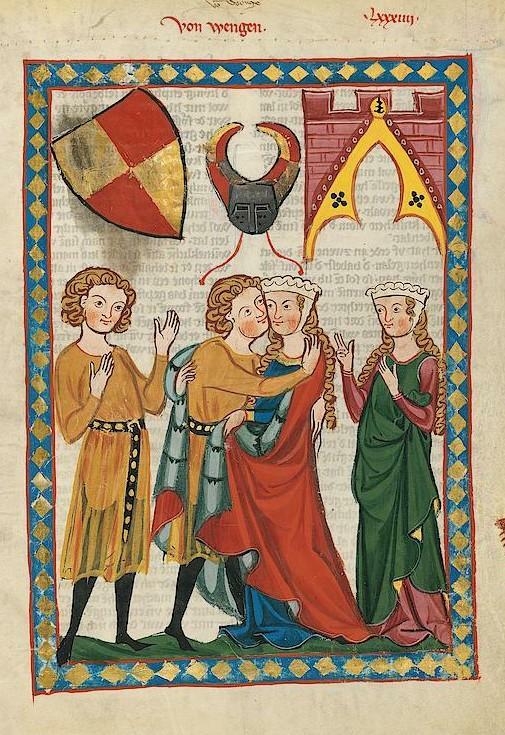 It appears the "man purse" isn't a new invention - the Gripping Beast guy has one. I managed to remove the capes from several of the Old Glory Teutonic Knights, and one of the Battle Honors Knights. The method of removal is not something I would recommend to anyone - unless one were trying to win a Darwin Award. I first used nail clippers to remove the larger parts of the capes. Next, I got this "brilliant" idea to use a soldering iron to melt off parts of the remaining cape. It actually worked and I managed not to drop molten lead on myself or the carpet. Well, I did melt off a leg from one figure - he's now in lead heaven. Finally, I used a Dremel with a tip normally used to sharpen steel blades. This was used to smooth out most of the remaining areas. Green Stuff was used to construct simple, if not crude, rear portions of the saddles. Here they are with their shields attached - I'm waiting for some helmets that I ordered from Mirliton. 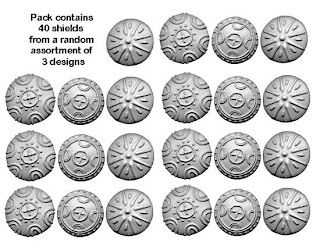 The center figure in the bottom row is a Battle Honors figure. The next photo shows them with an Old Glory Teutonic Knight with his cape still on. Besides the musician, these are the remaining Old Glory and Battle Honors figures that I won't do any modifications to due to either their capes (OG) or sleeved surcoats (Battle Honors) making it next to impossible to remove. Finished Otto Von Brandenburg's horse. His was a little more work, as his coat of arms is an eagle - which was reproduced eight times on the horse's barding. As with Ulrich Von Lichtenstein's horse, the basic color of the barding was painted and shaded then given a spray coat to protect it while the coat of arms were worked onto it. 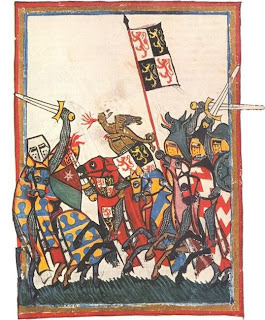 The escutcheons (shields) were drawn on and then painted white (argent). Next, the basic outline of the eagle was painted with reddish brown. 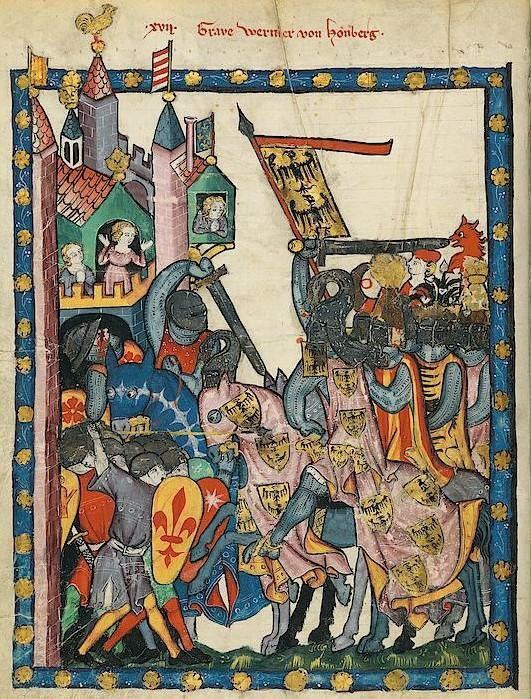 A sample sheet with coats of arms was used as a guide. The eagles were then "fleshed out" a bit with the darker red as a base. Finally, a lighter red was painted in the outline. Yellow (or) spines were also painted within the wings. Forgot that the eagles should be facing forwards - corrected after seeing this picture. Here are the horses for Von Brandenburg and Von Lichtenstein. The knights themselves are next to be painted.